You look so dashing in your outfit. I like the silver fox scarf which is not too overpowering. Of course, your Burberry coat looks so perfect and must be so warm. Then your Burberry bag is just beautiful. Love the straight cut of your jeans. :O this is flawless!! I love any place filled with history too - I miss living in Europe, we don't have many beautiful places like that here. you look so handsome. i feel you on the wearing darker neutrals during winter. here though it's starting to feel like spring. i love thr fur! 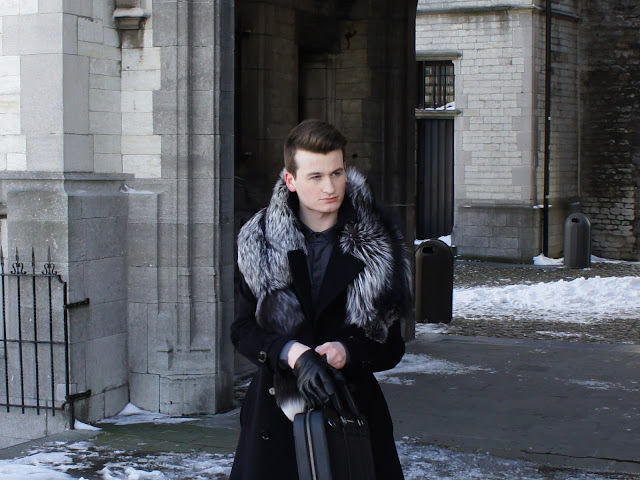 i adore the setting, outfit, and fur! Russian csar style! ;) Very luxurious. Love it. like this style! the fur makes it more fashionable. hope is faux fur! What do you think about following each other? GFC,FB,Twitter? OMG dit is echt een zalige outfit! Ik ben verliefd op de fur! So chic in Burberry and fur! Loving it! Absolutely loving this!! Very chic, elegant and perfectly groomed. You look stunning! You are a true inspiration!! LOVE Burberry and an all black ensemble you can't go wrong!